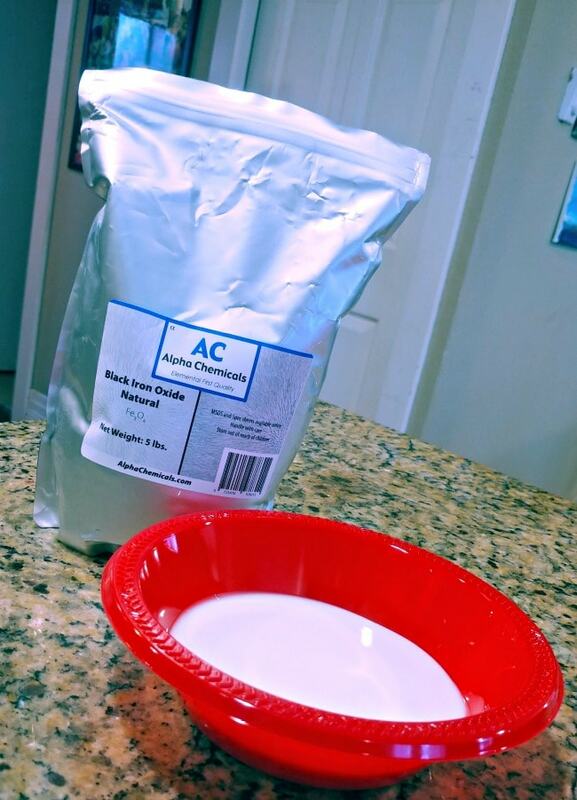 Magnetic Slime Recipe – Great for Science Projects & More! 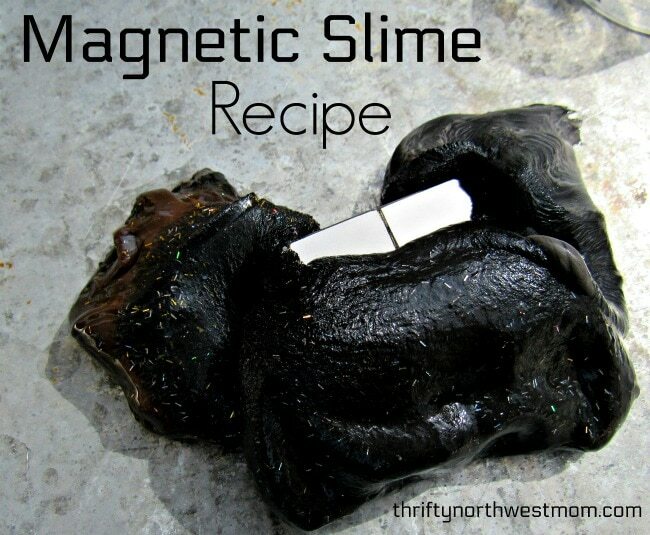 Magnetic Slime Recipe – Great for for fun or Science Project! 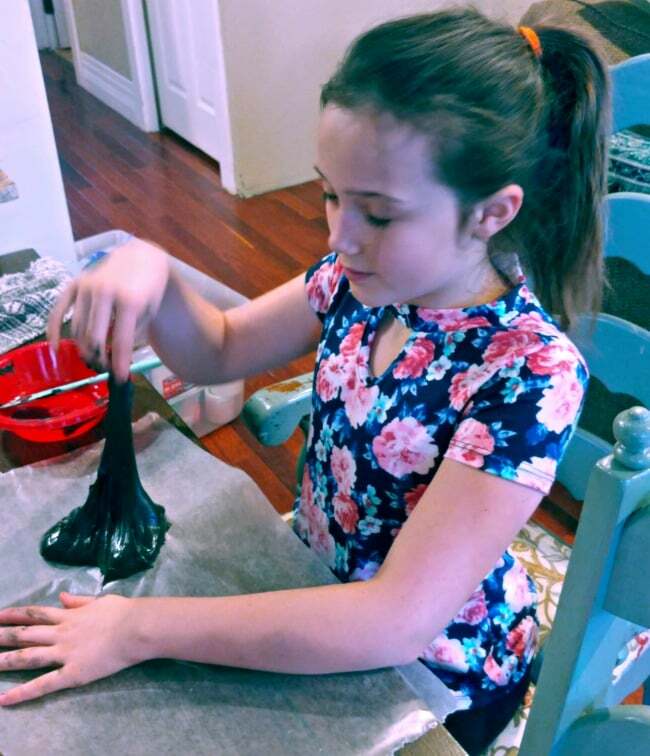 My kids are huge slime making fans, and so when it came time to select a science project for the science fair, it was no surprise that they decided to do Magnetic Slime. It is a little more complicated then other slime recipes, and uses some ingredients that do need adult supervision, but the kids LOVED making it and playing with it afterwards! If you are looking for other slime recipes, we have lots of really simple ones in this Slime Gift Basket & Recipes article here too. 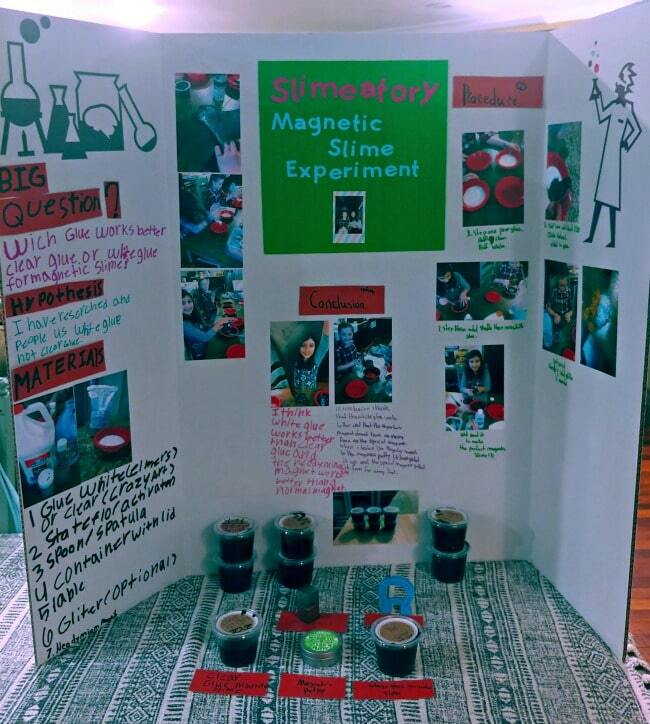 I can tell you that the magnetic slime was super popular at the science fair at school. There was always a crowd around their booth, and the kids could not resist playing with the slime. My kids also loved playing with it at home! 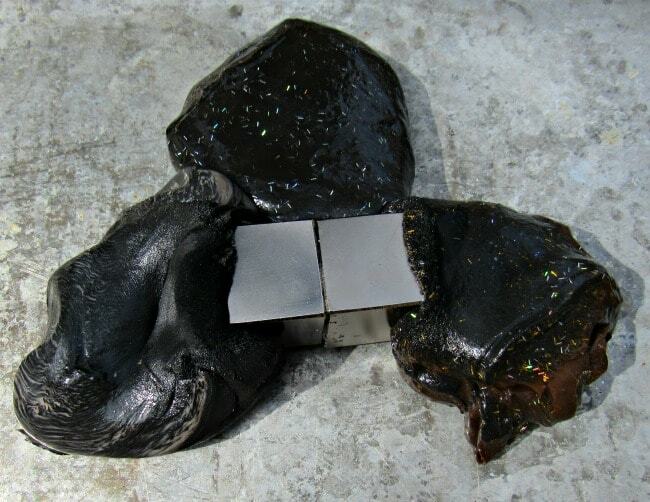 What makes Magnetic Slime so cool? Magnetic slime is not only fun as slime (stretches, pulls and pops), but you can also use magnets to play with it. 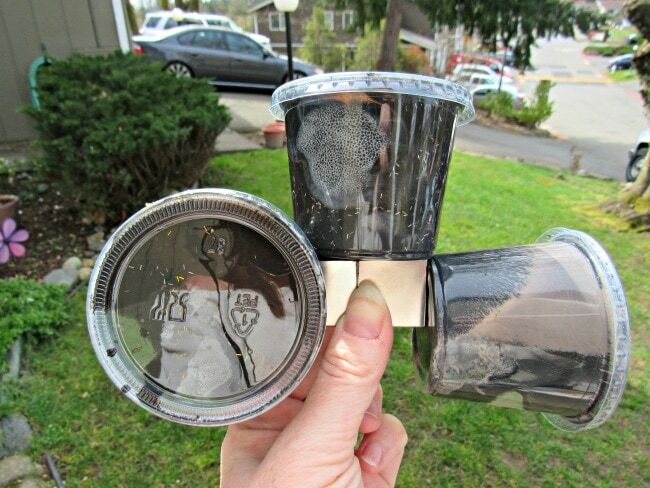 You can use one of two magnets with magnetic slime (and its fun to use both). Use a regular magnet. 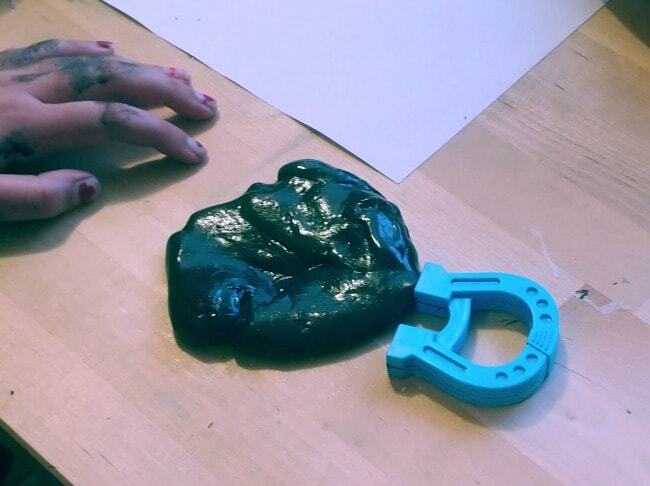 We found this fun horseshoe magnet that my kids used to play with their slime. You can use a special magnet called a neodymium (rare earth) magnet. This is a super strength magnet, and also needs adult supervision. You only want to use one of these magnets, as the pull is so strong that if you have two they can pull together and little fingers can get hurt if they smash between them. They are super cool though, as they essential eat the slime, so they are worth the extra effort required! 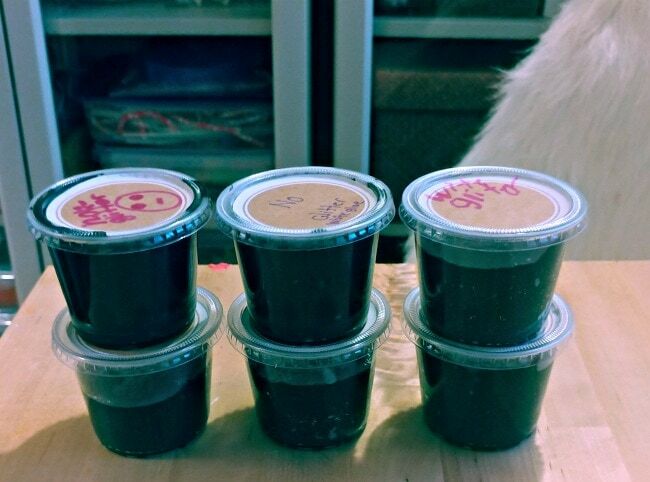 Why do you need adult supervision for Magnetic Slime? 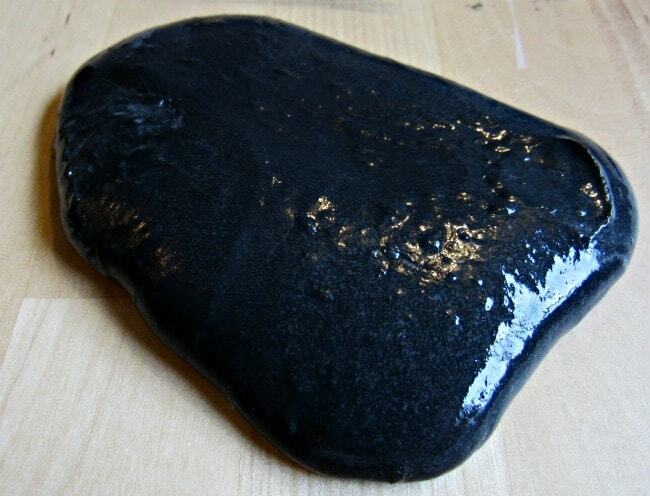 Magnetic slime is made like other slime recipes, but you add an ingredient called Iron Oxide Powder. 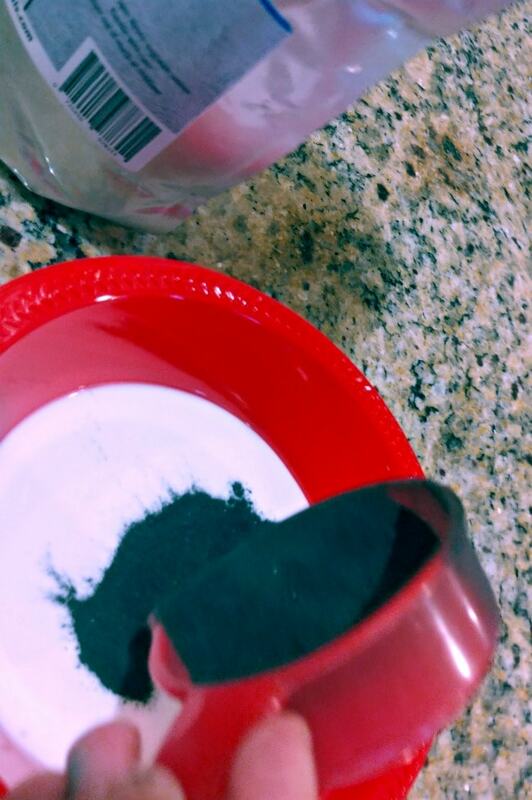 It is a powder you do not want the kids to inhale, so its best for a parent to add this ingredient and start mixing it in, and the kids can take over from there. The only part of this process I took over from the kids, was getting the iron oxide powder added, to insure they did not inhale it. Other then that it was just like making other kinds of slime. Note, this slime did turn the kids hands black while they made it, but it washed off easy enough. You might want to make sure your kids are wearing play clothes when making it. 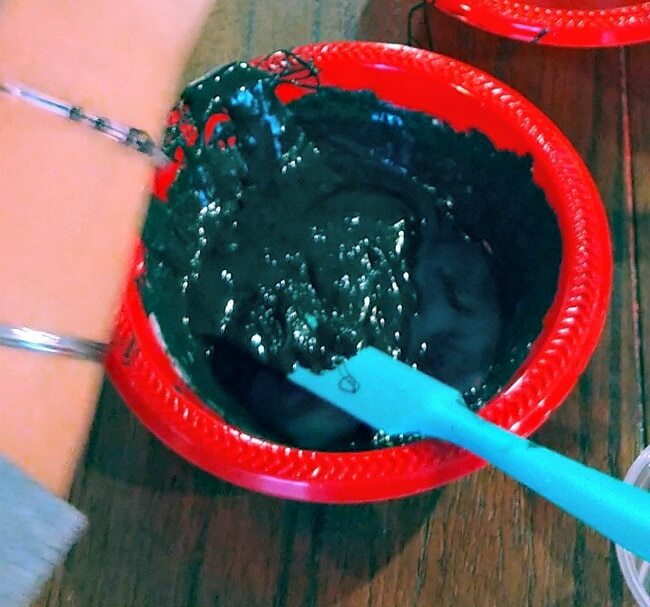 The Iron Oxide Powder will turn the slime black, as well as turning little hands black (but it easily washed off). We started by mixing the iron oxide powder directly to the glue. It is best to have an adult do this step. I added it to the bowl the kids had their glue in, and mixed it until their was no powder that might escape into the air and let the kids take over then. The concern here is that these are fine particles you do not want your kids inhaling if they mix roughly, etc. 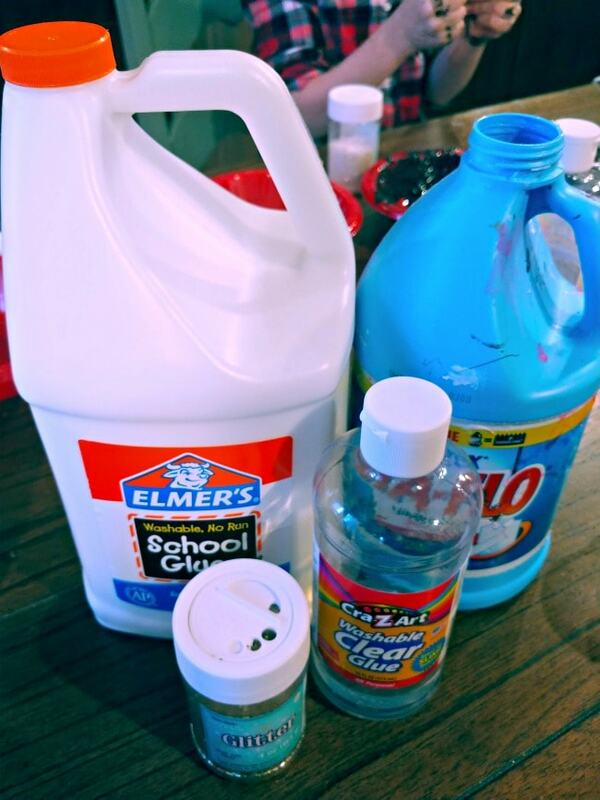 Once I had the iron oxide added to the glue the kids started adding the Stay Flo (activator) to this slime recipe. The recipe calls for 1/2 cup. but my kids who have been making slime forever insist that it works best if you add a little at a time until you get the consistency you want with your slime. They start by eyeballing about a 1/4 cup, and then add small amounts from there until it reaches a consistency that it does not stick to your hands any longer. I put wax paper down to protect the paper, but that did not work at all. It just stuck to the paper. We found it much easier to work directly on the table surface. 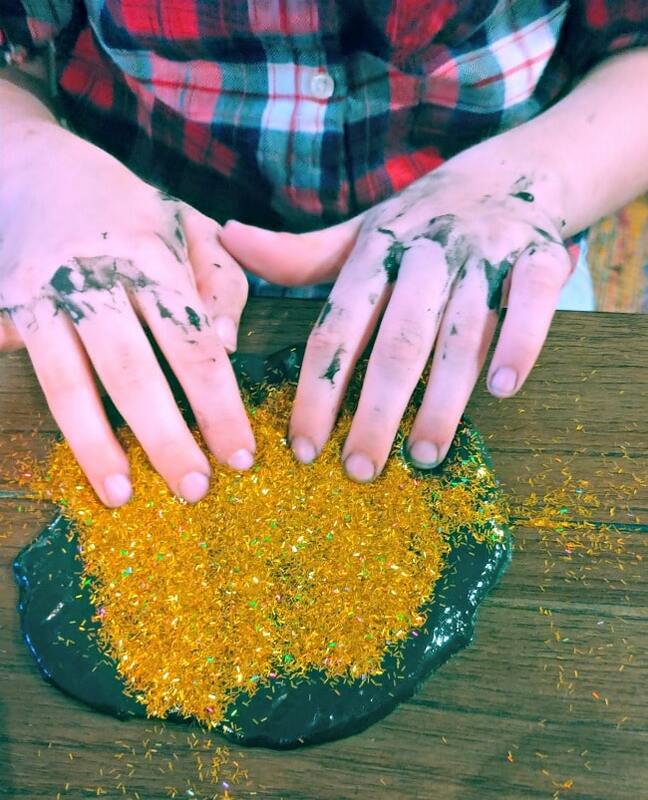 My girls loved mixing Glitter into half of their magnetic slime. They wanted to find out if that made any difference in the process. They determined that it was just as fun to play with (worked well with magnets), it just looked fun too. Once the slime is done, they can start playing with it. My kids used a regular magnet, and they were able to get it to stick to the slime, and do some fun stuff. But the real fun comes with the super magnet. Do a little research on these magnets, as they should be used with adult supervision too (and away from phones and electronics). 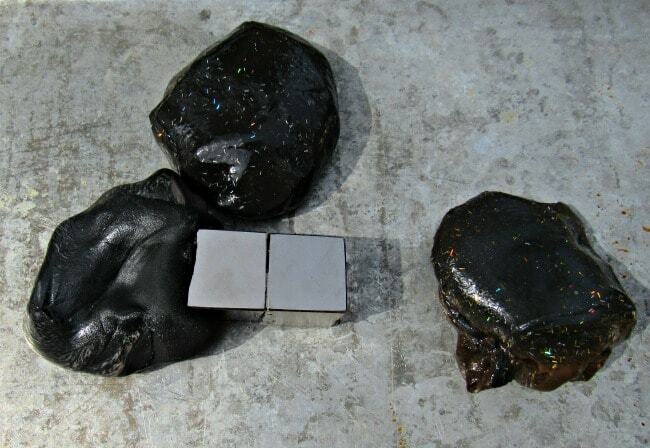 Here are three magnetic slimes in their containers, and look how strong that magnet is! They are so strong that we only use one magnet (or two stuck together) because the pull from one to another is so strong that little fingers can get smashed in between if you have two separate ones. 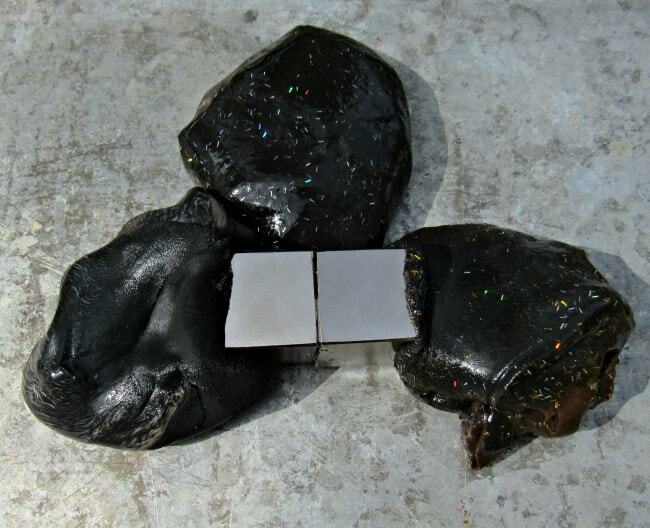 We set all three of these blobs of magnetic slime away from the super magnet. It started to pull them all towards itself immediately. Eventually its like the magnet eats the slime! One thing that is really fun with these magnets, is to set them about 2 inches away from the blog of magnetic slime. Then sit and watch the magic happen! The slime will pull the magnet to it slowly, and then proceed to “eat it”. 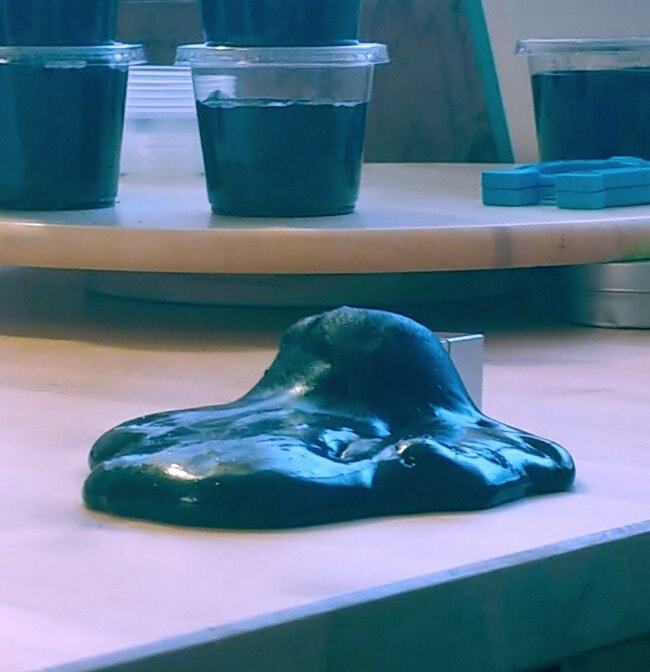 My 4th grader chose to make magnetic slime with one of her friends for a recent school science project. Their display was very popular with the kids, and they felt it was a great success. You could go so many different directions with this project, but the big question they determined they wanted to answer was a) how did the magnet used change things (regular magnet vs. super magnet) and did using Elmers white glue vs other brands clear glue have any impact on the final results. I won’t spoil the project with the answers, in case your kids wanted to do an experiment for themselves, but just wanted to inspire folks to try it. The girls shared their results in that bottom corner, but we took a picture before adding the spoiler information. The kids at the science fair loved it, and my kids loved making it, so it turns out to be lots of fun if your kids are looking for a project for a science fair! 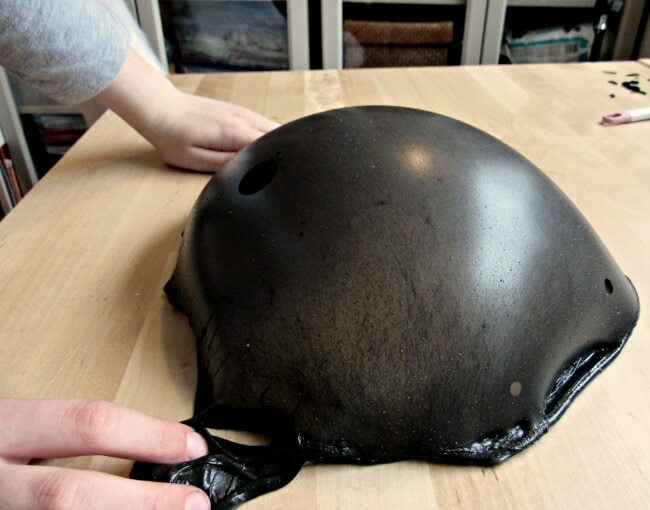 Have you made magnetic slime before? How did it work out for you?